- 2 POOD WAS HEAVY FOR ME. THAT WAS MY FIRST TIME SNATCHING 2 POOD KB W 1 ARM. 2K ROW = 7:23 = PR! MY SCORE = I GOT 18+12 OR 201 REPS! - ABLE TO TURNAROUND SLOWLY ON A HANDSTAND WALK - FINALLY! Untitled from Mike Abgarian on Vimeo. - FELT HORRID ABOUT 50 SQUATS IN ! MY SCORE = 100 GHD SITUPS! - USING THE METAL PLATES WHICH ARE CLOSER TO THE GROUND AND BEING IN MY PARENTS BACKYARD NOT ABLE TO DROP WEIGHTS WAS TOUGH. - DONT KNOW THE TEAM SCORE BUT I DID 81 PULLUPS UNBROKEN SO THAT A NEW PR AND DEF THINK I RHABDOED MYSELF. REST DAY - SORE AS HELL! SATURDAY - SUNDAY CROSSFIT EXPLODE LOCKDOWN! - RELAXING EXPLODE LOCKDOWN THIS WEEKEND! EACH RUN WAS UNDER 16 SECONDS. - WOULD HAVE BEEN 2ND PLACE OVERALL. THE HANG CLEAN ONE KILLED ME. WEAKNESSSSSSSS! - I DID THIS BACK IN SEPTEMBER AND GOT 18MIN+. SO THAT A BIG PR! - THIS WAS ONE OF THE MOST FUN I HAD DOING A WOD. IT WAS POURING RAIN LIKE A MONSOON OUTSIDE, AND DID THIS WOD WITH OUR 4PM GROUP. MY SCORE = 204 PULLUPS! MY TIME = 17:32 - PR ON THIS BY JUST ABOUT 5 MINUTES FROM SOMETIME IN JUNE!!! --- THE WHOL MOVEMENT FELT EXTREMELY LIGHT AND VERY HAPPY WITH MY OLMPIC LIFTING PROGRESS. SLACKING ON THE POSTS WILL RE START TOMORROW! RUN AS LONG AS I CAN AT 10% AND 10MPH. - WOD WAS MUCH TOUGHER THAN I THOUGHT IT WOULD BE. - 2:30 PR. GOT 10 MINUTES+ LAST TIME IN SEPTEMBER. FELT GOOD AND THE WEIGHT MOVED PRETTY SMOOTH. - DID THEM ALL EXCEPT REP#7 SCREWED UP ON THE JERK. 8X30 FEET HANDSTAND WALKS - DID 6 WITHOUT FALLING FELL A TOTAL OF TWO TIMES ON SET 4 AND 6. ROW 500 M - 1:34 - NEW PR **** DIDNT WANT TO GO HARD BUT GOT BACK FROM THE RUN AND WAS LIKE WHAT THE HELL. ALL 3 DONE RIGHT IN A ROW WITH THE ONLY REST TO SET UP. - WHERE TO START FOR THIS ONE. FIRST FROM DOIN THE MIKKO SALO AMRAP 40 FROM THE OTHER DAY MUSCLEUPS/ GRIP SUFFERED. ON TOP OF THAT I HAVE THIS HUGE BLISTER ON MY RIGHT HAND SO MY GRIP WAS ALL FINGERTIPS. 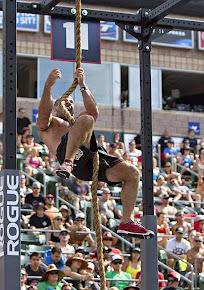 TOUGH WOD MAYBE BE ABLE TO SHED A LITTLE TIME OFF BUT MAN RUSSEL BERGER WITH 6:55 IS FLYIN. MY TIME - 13:48???? I KNOW IT WAS IN THE 13 SOMETHING BUT NOT SURE. DID FIRST SET OF PULLUPS UNBROKEN AND DROPPED THE BAR ON THRUSTERS THE 2ND GO AROUND. 2ND SET OF PULLUPS WAS 25 - 15 - 10. FOREARMS WERE LITTLE TIRED FROM WOD#1 BUT DIDNT EFFECT TO MUCH. W A 25 LBS VEST "CINDY"
- DEF WENT A LITTLE SLOW AT THE BEGINNING THINK I HAVE A GOOD CHANCE AT GETTING IN THE 12'S.